Senator Booker delivered a sweeping call to unite a deeply polarized nation around a "common purpose." Booker began reaching out to key constituencies Friday, calling in to three radio shows popular with black and Hispanic listeners. He spoke in fluent Spanish during his interview with Univision, vowing to work closely with "the Latino community," and discussed his support for marijuana legalization in another interview. Later on Friday, Booker will be a guest on "The View," a TV talk show popular with female viewers, where his mother plans to sit in the audience. 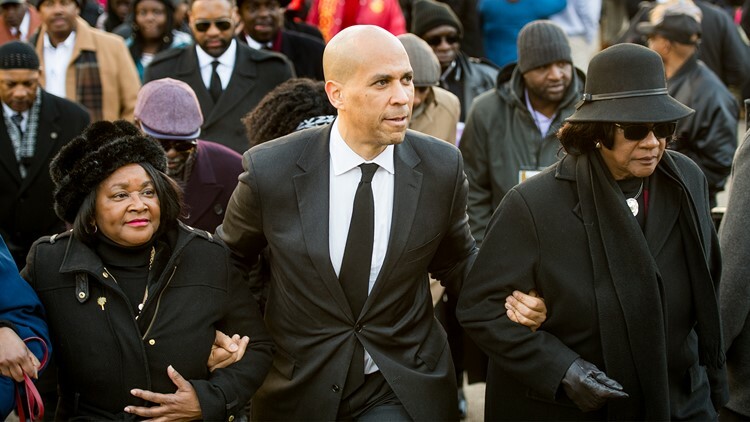 U.S. Sen. Cory Booker (D-NJ), center, president of the South Carolina NAACP chapter, Brenda Murphy, right, and South Carolina Rep. Annie McDonald (D-Fairfield), left, walk up the statehouse steps during the annual Martin Luther King Jr. Day at the Dome event on January 21, 2019 in Columbia, South Carolina. He also likely will stand alone as an unmarried candidate, though he brings a compelling personal biography that could help elevate his message that "the only way we can make change is when people come together." Booker's father grew up in a low-income community in North Carolina, and the senator has recalled his family's later struggle to settle in suburban New Jersey amid discrimination against black homebuyers. The senator has brought a heartfelt and passionate style to his achievements in the Senate, at times fusing his personal spirituality with policy proposals that focus on social justice. Booker played a key role in the bipartisan criminal justice reform bill that Trump supported last year, for example, helping strike that deal two months after sparring with Republicans during the battle over Supreme Court Justice Brett Kavanaugh's confirmation.